Ichikawa Danshiro IV as Yasha Goro from "Jiraiya"
Ichikawa Danjuro XII as Jiraiya from "Jiraiya". 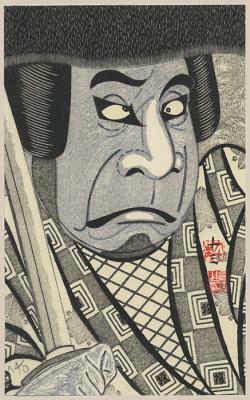 Ichimura Uzaemon XVII as Musashibo Benkei in "Benkei Joshi". 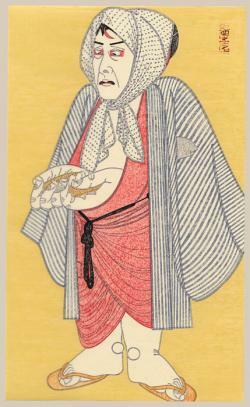 Nakamura Shikan VII as the widow Hagi no Kata in "Tamamono mae Asaji no Tamoto"
Ichikawa Ennosuke III as the ghost of Iwafuji in "Kagamiyama Gonichi no Iwafuji"
Kataoka Takao I, as Hayano Kanpei in "Michiyuki Tabiji no Hana Muko". 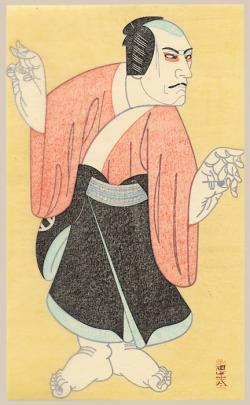 Onoe Kikugoro VII as Benten Kozo in "Shiranami Gonin Otoko". Born in Chigasaki City in 1946, into a family of painters, Kokei was fond of drawing as a child. After his junior-college education, he was a salaried worker for some years. 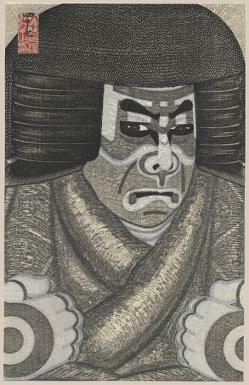 At age 32, he came up with an idea for making woodblock prints depicting Kabuki actors. 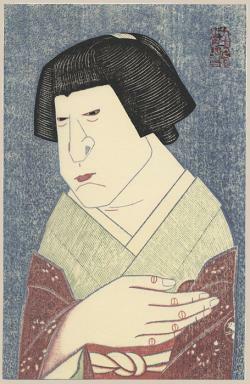 Greatly influenced by the Okubi-e (Bust Portraits) prints by Sharaku, Kokei produced his first series of nine prints. 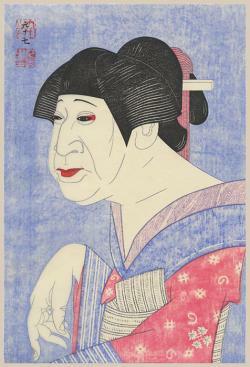 The Yoseido Gallery in the Ginza held a private exhibition of the works where they were noticed by Nagayama Takeomi, President of The ShochikuCo. Ltd., the firm that manages the Tokyo Kabuki Theater. 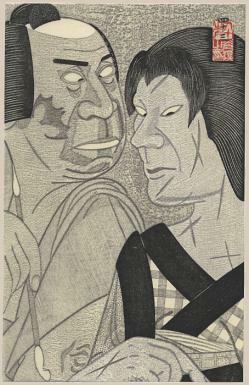 Kokei then received permission to sell his works at the Theater. By 1981 his work was purchased by Oliver Statler and other western collectors. His customer base increased and in 1983, The British Museum began to collect the works. In 1985 as subscription society (The Kokei Kai) was established on a membership basis only, enabling the sale of works to those outside Tokyo, as well as abroad. At age 51, and after talks with Mr. Nagayama, Kokei decided to complete the series with 200 designs, the last of which was finished in August 2000. From the initial sketch, to the finished prints, all steps were accomplished by Kokei. 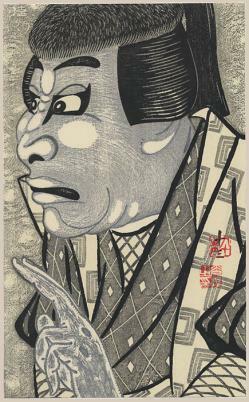 For each individual edition of 54 -90 prints he spent 40 -50 days: 10 creating the design, another 10 days for carving a set of woodblocks, and 20 - 30 days for the printing. 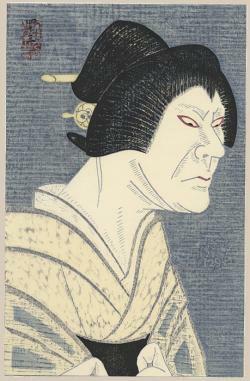 Kokei used a special, thin Ganpi paper - a most challenging medium - so that he could display his mastery as a printer. In addition to his rich yet subtle colors, he used mica, gold and silver powders for an overall powerful effect. Kokei marked each print with this seal, numbered each in sumi-e ink, and then defaced the blocks so that no further prints could be produced.